On August 16, 1774, the Suffolk Resolves, the pre-cursor of the Declaration of Independence, was drafted at the Doty Tavern in Canton, MA. Tom Doty was the proprietor. 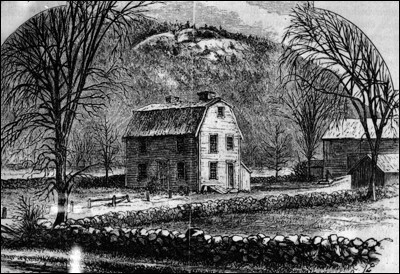 The tavern was chosen because it was hidden from British oversight by the towering Great Blue Hill. The document was subsequently signed in nearby Milton, MA. It was then carried by Paul Revere (his slightly less famous horse ride) on a six day journey to the First Continental Congress in Philadelphia where it was adopted on September 17, 1774. The Doty Tavern was a popular stop-over spot on the old road between Boston and Taunton. George Washington slept there as did the Marquis de Lafayette, and Tom Doty was well known for the high quality of his brew, fine meals and warmth of hospitality. Tom Doty (1703-1795) was also known to the locals as Col. Thomas Doty. The Doty Tavern was well established by 1726, and burned on December 20, 1888. 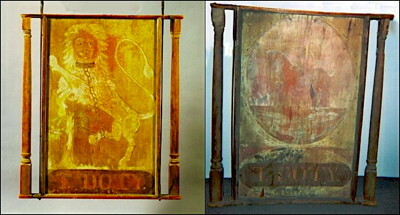 But in 2008, the Friends of Prowse Farm (on whose land the tavern was located), purchased the original tavern sign for $28,440.00, and it has now come home. A recent archeological dig has located the exact site of the Doty Tavern. The top photo shows an 1876 drawing of the Doty Tavern with Great Blue Hill in the background, and the other photos show the front and back of the tavern sign that survived the 1888 fire.